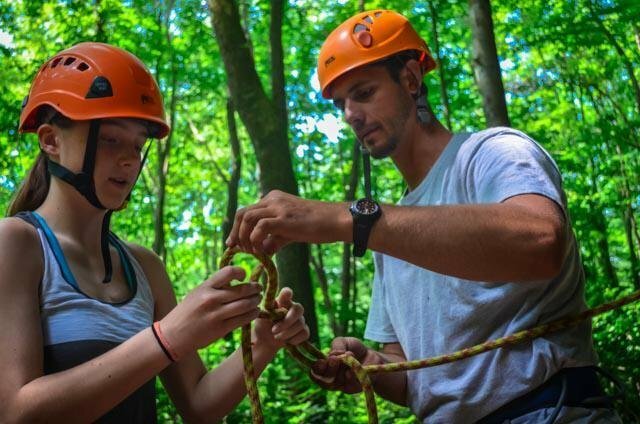 Whether you live nearby and want to explore your own backyard, or if you’re coming from far away to see new places and meet new faces…you’re guaranteed to find a fresh way to reconnect with your family at Laurel Highlands River Tours. If you’re a mother or father, aunt or uncle, consider rock climbing or white water rafting in Ohiopyle State Park to find relief from the bustling heat of the city and a cool way to make great memories with your children, nieces, or nephews. When people vacation in the Laurel Highlands it is because they want a more memorable vacation and the chance to live more fully. 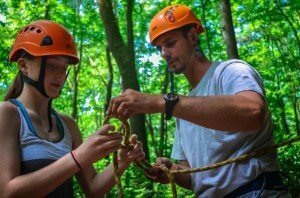 They come here to explore new terrain and new perspectives from zip-lines and rope courses, rafts and kayaks, climbing harnesses and bikes. They come here because they want to share that experience with the people who matter most. 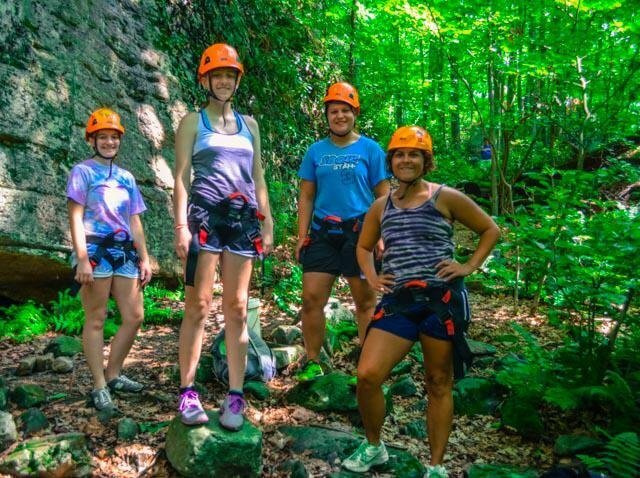 This week I had a chance to meet a family who did just that as I tagged along with a Laurel Highlands River Tours rock climbing trip to take some photos for the website. It’s pretty common to also come out with a good story or two when you share an experience like climbing or rafting with others. Whether you’re family, friends, coworkers, or strangers when you start off on an adventure, you always walk away with a bond that brings you closer. As I hop into the van on our way to the trailhead, I turn to meet five ladies who are already chatting excitedly. I ask some general questions about how they know each other and what brings them to the area. I quickly learn they aren’t your ordinary family. Margaret, the enthusiastic one leading the brigade of young climbers, is the aunt of Stacia, Taylor and Hannah, and every year she takes her nieces on a new adventure. 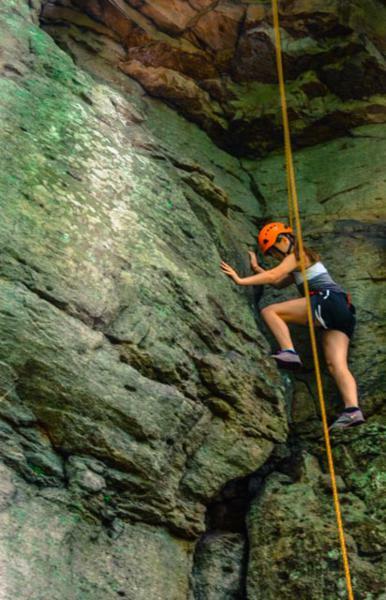 They’ve gone camping all over the country—hiking to waterfalls in Great Smoky Mountains National Park, exploring caves in Arkansas, and whitewater rafting in Shenandoah. This year they’ve also invited their friend, Lindsey, to join them on the excursion—rock climbing in the Laurel Highlands. Margaret is the only one besides myself not wearing a climbing harness. She’s had both knees replaced, and though she takes careful steps along the trail and jokes about being slow and steady like the tortoise, she hasn’t let anything stop her from spending time in the great outdoors with her family. Climbing was the girls’ idea she tells me, and she is eager to help them live their dreams. As they get older it gets harder to schedule trips between their internships, volunteering, work, and planning for college. But it is clear that they are all excited about spending time together on vacations like this where they get to explore new places, take on challenges, and try fun activities. After we hike into the woods and reach the first climbing spot, their guide, Shane, shows the girls how to properly knot the rope through their harnesses and gives them advice about using more leg strength than arm strength, looking for your handholds, and how to lean back when coming back down the rock face. He asks who is climbing first and Hannah, the youngest, shoots her hand up as far and fast as it will move. She scrambles up the rock with ease, smiling without fear as she reaches the top and returns to the ground below. After they’ve all taken a few turns going up and down, they all climb quickly, comfortably, and with ease. So we decide they are ready for the next, more challenging rock wall. While Shane gets the ropes ready at the top—which looks much further away from our new location—the girls talk about what they each like most about climbing so far. Stacia loves coming back down because she loves the feeling of moving fast and free. Taylor likes reaching the top because she feels a sense of pride and accomplishment while Lindsey simply enjoys the climb because of the challenge and the focus it demands. Hannah lights up as she talks about choosing her line—deciding where to place her left foot and where her right hand will reach for the best grip. From my vantage point behind the camera, it is wonderful watching all of their different skills, personalities, and preferences complement each other as the girls help each other more and more as the climbing gets harder. This approach starts with standing on top of a tall pile of rocks and reaching for a hand hold on the rock wall that’s well above their heads while trying to leverage with one foot placed in a crack that is also far enough above them to make a yoga master stretch. The rock here is also a harder granite that hurts your fingers when you grip it too tightly. One by one the girls get a good start but cannot get past the first, most difficult move. Even looking on it looks hard enough to make someone give up, but they are even more determined to succeed now. While Hannah tries again, the other girls give her encouragement and coach her to the best holds on the face. When she touches the anchor at the top she is beaming, and everyone below is cheering her on. Now they are unstoppable. Taylor goes next and is climbing like a pro. But when she is only a couple yards from the top she hesitates. She is struggling to find the next move and looks down for a moment, as if considering her option to stop and lower down. Instead, she looks up and keeps reaching. She tries a line to the right, and when it doesn’t work she moves left. Before she knows it she reaches the finish line and looks victorious. The eldest, Stacia, is nervous—not about the height, but that she is not a good enough climber—and says she doesn’t want to climb anymore. Her aunt, sisters, and friend let her know how much faith they have in her and remind her that she would regret not trying, and so she ties in and climbs on with one of the quickest, smoothest lines of the day. It is Lindsey’s turn and she has not stopped concentrating on the cliff since her first attempt. “I am going to climb that rock,” she tells me with a voice that lets me know she means it. While she is getting ready for her turn, the last ascent of the day, heavy rain starts falling down. We are under the canopy of a thick, green forest, but it is still only a matter of moments before the rock gets too slippery to climb. She’s been enthusiastic enough to get everyone else pumped up and confident all day, and now we can see it in her face that this is her moment. She is so determined to succeed that she doesn’t even seem to notice the rain until she proudly reaches the top of the world. An hour ago this line looked unattainable to them. Now, all four of them are smiling from ear to ear having touched the top by reaching deep into their own reservoir of strength and by telling the other girls they can do it—and helping with how to do it—when they had moments of self-doubt. On the hike back to the vehicle some of them are already talking to Margaret about coming back to climb with their basketball team. 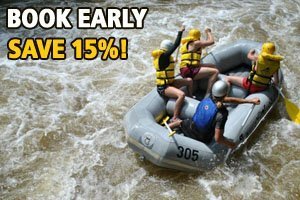 People who were afraid of heights or rapids come here and find themselves laughing and having fun as they gain confidence in their abilities and a uniquely humbling reverence in nature. No matter how young, old, athletic, shy, or bold, everyone who comes here leaves with something that can’t be found at any beach resort or amusement park.